! This is NOT a method of direct communication with MORROW FLORIST & GIFT SHOP for purposes of ordering or rectifying problems. I called Morrow Florist and received exemplary service as this company went above and beyond what was expected to provide the greatest level of service in its delivery of flowers to my family member in Morrow! Great company and great service -- highly recommended!!!! Basket was nice and filled with fruit and treats that she enjoyed. The flowers were beautiful! Super fresh! Arranged in a gorgeous square vase! Very happy! Exceptional service. My wife loved the arrangement. Will Recommend to anyone without reservations. Thank you for the beautiful funeral arrangement of roses. It was the perfect way to say goodbye to a friend!! Keep up the excellent work. Arrangements are marvelous. Your flowers were BEAUTIFUL!!! Very Fall Like and decorated my office well. Thanks!! The sunflowers my friend received were absolutely beautiful! I was very pleased. Delivery was prompt and the flowers were beautiful. Thank you! She really loved the arrangement. Awesome job! From a loyal customer. Flowers premade in store may be better. Flowers delivery typically does not match what's shown on website. Ordered with ease. Perfect same day delivery. Flowers were said to have been beautiful (did not personally see). Cost with delivery was acceptable and in range with other florist. Overall was very satisfied. The arrangement looked better than the actual picture on the website, (which made me very happy, as sometimes when you order online, you do NOT get what think you're getting). The flowers were beautiful, pretty blooms. The flowers were delivered in a timely fashion and the recipient loved them. I will definitely use Morrow again if I need to send flowers in their area! The flower were delivered in excellent condition. I just forgot to add my name on the card. The flowers were gorgeous and delivered on time. Thanks so much! The arrangement I received was lovely and is holding up nicely. It was very convenient to order on line. I received a phone call stating the item was not available in that container and they would substitute with another container. Website should be updated. The delivery was very fast and my husband was very surprised. I have been a long time customer with Morrow Florist and have never been disappointed. I'm living abroad and their services were spot on. The flower arrangement was amazing. I recommend their servicers hands down. I made a purchase online one night and the flowers were delivered the very next morning. They were fresh and beautiful.Great Job!! I could not have asked for a more beautiful arrangement to honor my Grandmother. The flowers were fresh, vibrant, and plentiful - even more beautiful than the website could portray. Thank you so much. I know my Grams was impressed. ?? My flower arrangement is gorgeous. I've received so many compliments. The flowers are fresh and colorful. Thank you so much! on time and beautiful flowers...still perky after 4 days!! Very pleased with the beautiful arrangement we order for a funeral - outstanding job!!!! I am very pleased. The family of recipient expressed great appreciation for this arrangement, and felt as I did, that their mother would have loved it. They took it home ti further enjoy. The arrangement is beautiful and very full. I have never been disappointed with an arrangement from your shop. Thank you from my husband and myself. I was happy enough with the layout of the website however I would prefer to have better illustration on the different sizes of the arraignments. I could not really know what I was getting if I spent more money....like the "shown as" part but did not know how that relates to more/less expensive versions. I so appreciate you bringing them to home address after finding out I wasnt at work.my sister loved them. The local florist did their usual good job. 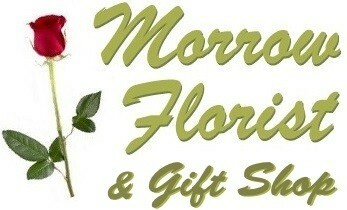 It is always a pleasure to do business with morrow florist. Great customer service and friendly employees. The arrangements are always on point and most importantly the flowers last. The floral arrangement was beautiful and very large. Great service delivery was right on time. I will use your services again. Thanks. It was awesome, the bouquet of roses were very beautifully arranged, 2 dozen red roses with baby breaths. I was the talk of the office for several days, co-workers wanted to take a picture and send it to their men to let them know this is how a woman should be pampered especially on Valentine’s Day! WOW! Very dependable. The flowers were for a funeral. They arrived early for the family to see before the viewing. The plant was beautiful and well worth the money. Thank you. The family held up the flower basket (for acknowledgement) at the funeral service, and, the arrangement was beautiful. Thank you again. We lived too far away to attend a family funeral in that part of the country, so I ordered flowers through their web site. They did a great job. We got lots of comments on how beautiful the arrangment was and how it stood out in the room. The site was easy to navigate and the pictures were a good representation of what the arrangements look like.